With the versatility of a studio and tablet. Now with the new 8th Generation Intel Core i5 processor. Starting at just 1.7 lbs. Made with luxurious Alcantara ® material and rich colors for a full keyboard experience. You’ll experience fast start-ups, a familiar yet expanded Start menu, and great new ways to get stuff done. And with automatic updates enabled, you get all the latest features and security hassle-free. Using Surface Dial (sold separately) and Surface Pen (sold separately). Bring your ideas to life on the stunning screen that responds to your touch. Syncs with your other devices, including iPhone and Android. Take notes, navigate, draw, doodle, edit and make. Discover all the ways you can be productive and get creative with a digital pen. 1Up to 13.5 hours of video playback. Testing conducted by Microsoft in August 2018 using preproduction Intel Core i5, 256GB, 8 GB RAM devices. Testing consisted of full battery discharge during video playback. All settings were default except: Wi-Fi was associated with a network and Auto-Brightness disabled. Battery life varies significantly with settings, usage, and other factors. 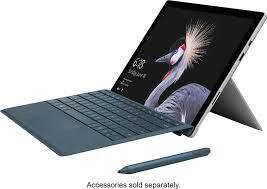 2Fanless cooling system included with Surface Pro 6 i5 model only. System software uses significant storage space. Available storage is subject to change based on system software updates and apps usage. 1GB= 1 billion bytes.